In the U.S. at least, Apple has greatly expanded its universal search feature for the fourth-generation Apple TV, most notably adding support for its own Apple Music. Owners can now open movies and shows hosted on the service if they appear in search results. 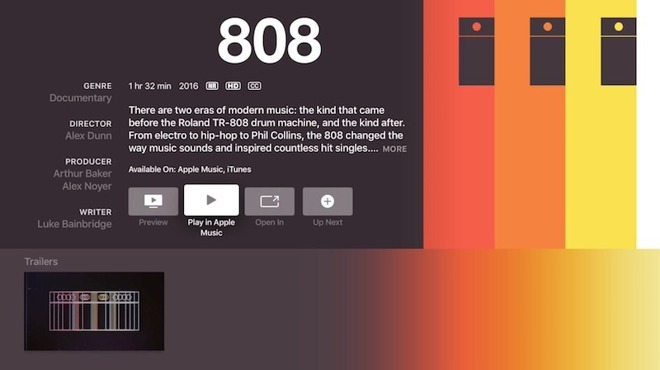 The option is of relatively limited use at the moment, as many videos hosted on Apple Music —such as the full-length documentary 808 —are already exclusives. Apple has also added support for major networks TBS and TNT however, along with the popular anime service Crunchyroll. Other additions include Animal Planet GO, CuriosityStream, Investigation Discovery GO, Science Channel GO, TLC GO, and Tribeca Shortlist. The one addition outside the U.S. is in Germany, where people can now get results for Galileo. Similar to Roku, the Apple TV's universal search feature displays multiple options for watching any particular video, so long as a person already has the appropriate apps installed and regional coverage is available. The latter is still a weak point, since Apple's U.S. coverage is several times bigger than for any other country.